Yesh Atid denies party intends to boycott celebration of 50th anniversary of Jewish return to Judea and Samaria. 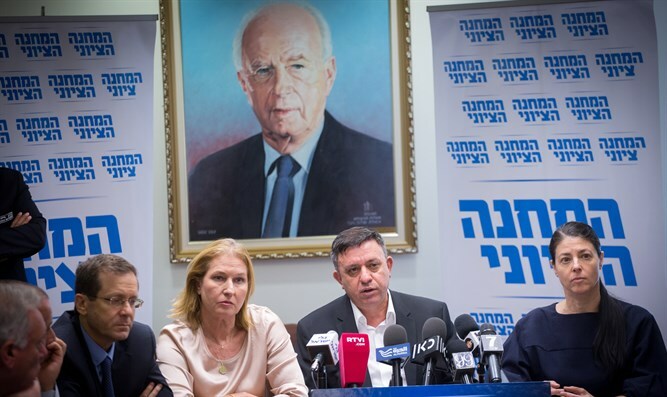 The Zionist Union party will boycott the official state event marking 50 years of settlement in Judea, Samaria, the Jordan Valley, and the Golan on Wednesday, according to reports this evening on Kan 11. The Yesh Atid party was also reportedly boycotting the event. According to the report, the Labor Party claimed that had their presence been wanted at the event, the party chairman or opposition leader would have been invited to deliver a speech there. Meanwhile, criticism was voiced against Labor chairman Avi Gabai for not instructing party members to absent themselves in an official communique. Yesh Atid chairman Yair Lapid denied that the party had decided to boycott the event. Addressing "all those who are worrying," Lapid confirmed that Yesh Atid MK Chaim Yellin will attend the celebration. MK Eitan Cabel (Zionist Union) published a Facebook post in which he wrote, "No member of the Knesset from the Zionist Union should participate in the 'state ceremony marking the anniversary of the liberation of Judea and Samaria, the Jordan Valley, and the Golan Heights', and the fact that this ceremony was produced by the Information Center using tax funds with no regard to our opinion is a badge of shame for us." "I am not one of those who in Pavlovian fashion oppose any matter related to settlement and the Bible is for me the keystone of my perception of our existence in the Land of Israel. In addition, I believe and support the concept of two states for two peoples, with the settlement blocs being an integral part of any agreement, including the Golan Heights and the Jordan Valley. In the face of this concept, the Prime Minister and the extreme right lead us into the vast abyss of one state for two peoples, which will destroy the Jewish state and bring an end to the vision of the prophets of Israel and the founders of Zionism. I believe that a moral call must come from our camp, which will express a clear and unequivocal moral opposition to participation," Cabel added. Shlomo Neeman, head of the Gush Etzion Regional Council, said: "It is inconceivable that a party that defines itself as a Zionist party, a party whose ancestors were an inseparable part of the establishment of settlement 50 years ago, chooses to boycott the day on which a big step was taken for the sake of the country." "Prime Minister Yitzhak Rabin and President Shimon Peres are turning over in their graves over the way their party chose to continue their heritage. It isn't too late to come down from the olive tree they climbed in the name of peace and reach the oak tree (the famous oak tree in Gush Etzion, the only remnant of Jewish life there after the Arabs overran the bloc in 1948) to celebrate the event taking place in the Gush and to remember the founders of the state - who founded the boycotters' party." Deputy Foreign Minister Tzipi Hotovely said that "those who boycott half a million settlers and don't intend to be a partner in the government's Jubilee celebrations in Gush Etzion should not look for votes on the Right." It was revealed to Arutz Sheva that the European Union's ambassador to Israel, Emmanuel Joffre, does not intend to take part in the ceremony although he was officially invited to it. The office of the EU ambassador to Israel confirmed to Arutz Sheva that he was invited to the ceremony, but his decision not to participate is consistent with EU policy on the issue. "The ambassador does not come to official events of the State of Israel beyond the Green Line," said the office of Ambassador Joffre.